A series of immobilization methods has been established to allow the targeted irradiation of live Caenorhabditis elegans individuals using a recently developed ultra-thin polydimethylsiloxane microfluidic chip with water retention. This novel on-chip immobilization is also adequate for imaging observations. The detailed treatment and application examples of the chip are explained. Suzuki, M., Sakashita, T., Funayama, T. Immobilization of Live Caenorhabditis elegans Individuals Using an Ultra-thin Polydimethylsiloxane Microfluidic Chip with Water Retention. J. Vis. Exp. (145), e59008, doi:10.3791/59008 (2019). Radiation is widely used for biological applications and for ion-beam breeding, and among these methods, microbeam irradiation represents a powerful means of identifying radiosensitive sites in living organisms. This paper describes a series of on-chip immobilization methods developed for the targeted microbeam irradiation of live individuals of Caenorhabditis elegans. Notably, the treatment of the polydimethylsiloxane (PDMS) microfluidic chips that we previously developed to immobilize C. elegans individuals without the need for anesthesia is explained in detail. This chip, referred to as a worm sheet, is resilient to allow the microfluidic channels to be expanded, and the elasticity allows animals to be enveloped gently. Also, owing to the self-adsorption capacity of the PDMS, animals can be sealed in the channels by covering the surface of the worm sheet with a thin cover film, in which animals are not pushed into the channels for enclosure. By turning the cover film over, we can easily collect the animals. Furthermore, the worm sheet shows water retention and allows C. elegans individuals to be subjected to microscopic observation for long periods under live conditions. In addition, the sheet is only 300 µm thick, allowing heavy ions such as carbon ions to pass through the sheet enclosing the animals, thus allowing the ion particles to be detected and the applied radiation dose to be measured accurately. Because selection of the cover films used for enclosing the animals is very important for successful long-term immobilization, we conducted the selection of the suitable cover films and showed a recommended one among some films. As an application example of the chip, we introduced imaging observation of muscular activities of animals enclosing the microfluidic channel of the worm sheet, as well as the microbeam irradiation. These examples indicate that the worm sheets have greatly expanded the possibilities for biological experiments. Radiation, including X-rays, gamma rays, and heavy-ion beam, is widely used for biological applications such as in cancer diagnosis and treatment, and for ion-beam breeding. Numerous studies and technical developments are currently focusing on the effects of radiation1,2,3. Microbeam irradiation is a powerful means of identifying radiosensitive sites in living organisms4. The Takasaki Advanced Radiation Research Institute of National Institutes for Quantum and Radiological Science and Technology (QST-Takasaki) has been developing a technology to irradiate individual cells under microscopic observation using heavy-ion microbeams5, and has established methods to enable targeted microbeam irradiation of several model animals, such as the nematode Caenorhabditis elegans4,6, silkworms7, and Oryzias latipes (Japanese medaka)8. Targeted microbeam irradiation of the nematode C. elegans allows the effective knockdown of specific regions, such as the nerve ring in the head region, thus helping to identify the roles of these systems in processes such as locomotion. A method for on-chip immobilization of C. elegans individuals without the need for anesthesia has been developed to allow for microbeam irradiation4. In addition, to improve microfluidic chips used in the previous study4, we have recently developed wettable, ion-penetrable, polydimethylsiloxane (PDMS) microfluidic chips, referred to as worm sheets (see Table of Materials), for immobilizing C. elegans individuals9. These comprise of ultra-thin soft sheets (thickness = 300 µm; width = 15 mm; length = 15 mm) with multiple (20 or 25) straight microfluidic channels (depth = 70 µm; width = 60 µm or 50 µm; length = 8 mm) at the surface (Figure 1A-D). The microfluidic channels are open and allow multiple animals to be enclosed in them simultaneously (Figure 1E). The sheets are resilient to allow the microfluidic channels to be expanded (by ~10%, Figure 1F), and the elasticity allows animals to be enveloped gently. Also, owing to the self-adsorption capacity of the PDMS, animals can be sealed in the channels by covering the surface of the worm sheet with a thin cover film, in which animals are not pushed into the channels for enclosure. By turning the cover film over, we can easily collect the animals. The channels do not hurt the worms when they are being enclosed or when they are collected. Furthermore, the sheets are made from PDMS, which is essentially hydrophobic, but water retention can be achieved by imparting hydrophilicity to the material. The water retention and thickness are favorable characteristics of the worm sheets. The water-retention capacity prevents dehydration of the animals after prolonged immobilization and enables long-term observations to be carried out. In addition, as described previously9, the sheets are only 300 µm thick, allowing heavy ions such as carbon ions (with a range of about 1 mm in water) to pass through the sheet enclosing the animals. This allows the ion particles to be detected and the applied radiation dose to be measured accurately. Moreover, the worm sheets can be reused and are thus economical. With the conventional injection method, the animals enclosed are sometimes dead and they cannot be taken out of the channel; their eggs can also clog the channels. This makes the chip unusable. Chips are, therefore, basically disposable and the cost-benefit ratio is poor. In the present paper, we describe in detail a series of methods for on-chip immobilization of live C. elegans individuals using worm sheets. Through locomotion assays of animals 3 h after on-chip immobilization, we evaluated the suitable cover film. In addition, we showed the examples of on-chip immobilization for both imaging observations and microbeam irradiation. Select a suitable strain of C. elegans and Escherichia coli (food) depending on the purpose of the experiment. NOTE: In the present paper, wild-type N210C. elegans (Figure 2A) is generally used, and HBR4:goeIs3[pmyo-3::GCamP3.35::unc-54 - 3'utr, unc-119(+)]V11 is only employed for imaging assay. E. coli OP50 was used as food for C. elegans. Some mutants with abnormal body shape, such as the unc-119(e2498) III mutant with a coiled shape (Figure 2B), also can be enclosed in the straight microfluidic channels (Figure 2C). Maintain the C. elegans at 20 °C on 6 cm Petri dishes containing 10 mL of nematode growth medium (NGM) spread with overnight-incubated (37 °C) E. coli as described previously10. If possible, synchronize the developmental stages of C. elegans from the embryo stage. Use well-fed adult animals, approximately 3-4 days after hatching with a width of about 50-60 µm, which are optimally suited to the size of the microfluidic channels in the worm sheets. For wettable worm sheets, use any buffer solution depending on the purpose of the experiments. NOTE: Suitable buffer solutions for on-chip immobilization on PDMS microfluidic chips have been defined previously9 and the following buffer solutions were shown to have no effect on the motility of the animals after immobilization: S basal buffer solution (5.85 g of NaCl, 1 mL of cholesterol (5 mg/mL in ethanol), 50 mL of 1 M pH 6.0 potassium phosphate, H2O to 1 L; sterilized by autoclaving)10 containing a large amount of NaCl, M9 phosphate buffer solution (5 g of NaCl, 3 g of KH2PO4, 6 g of Na2HPO4, 1 mL of 1 M MgSO4, H2O to 1 L; sterilized by autoclaving)10, wash buffer solution (5 mL of 1 M pH 6.0 potassium phosphate, 1 mL of 1 M CaCl2, 1 mL of 1 M MgSO4, 0.5 g pf gelatin, H2O to 1 L; sterilized by autoclaving)12 containing gelatin, and ultrapure water9. In the present paper, wash buffer solution is typically used, and S basal buffer solution is only employed for evaluating on-chip immobilization using different cover films in the section 3. For conventional microfluidic chips without wettability, use a wash buffer solution, which provides the most effective means of maintaining moisture in the microfluidic channels of the chip and thus prevents drying of C. elegans individuals (regardless of the wettability of the microfluidic chips). Prepare different cover films as follows. Based on the ease of handling, cut the following transparent, biocompatible cover films to a suitable size (i.e., width of 10-15 mm and length of 30-50 mm): 130-170 µm thick cover glass, 125 µm thick polyester (PET) film, and ~130 µm thick polystyrene (PS) film. Perform 3 h on-chip immobilization using different cover films as follows. Based on steps 4.1-4.6, enclose ≥10 washed adult animals (3.5 days after hatching) in the worm sheet using each cover film, respectively, and leave for 3 h.
For comparison purposes, allow 3 h of free movement as follows. Place ≥10 washed adult animals on a 3.5 cm plate containing 3 mL fresh NGM, cover with a lid, and leave for 3 h.
Collect animals immediately after 3 h of on-chip immobilization according to steps 5.1-5.3. Remove the cover film from the worm sheet and add a drop of buffer solution to each animal. Pick up animals swimming in the droplet using a platina picker and transfer them to a 3.5 cm plate containing 3 mL fresh NGM without food (assay plate). Collect animals after 3 h of free movement. Add a drop of buffer solution to each animal. Pick up animals swimming in the droplet on the NGM plate and transfer them to an assay plate using a platina picker. Evaluate the effects of cover film on motility (locomotion assay). At least 5 min after transfer to the assay plate, count 'body bends' (deﬁned as the number of bends in the anterior body region at 20-s intervals) manually under a microscope13. Carry out locomotion assays five times independently for each cover film. NOTE: In the experiments shown in the representative results, 10 animals were evaluated for each experiment in which multiple animals were enclosed simultaneously, compared with only five animals counted in the previous study13. Calculate the average number of body bends for the 10 animals in each group for each experiment. Then average the values from five independent experiments to evaluate the eﬀects of on-chip immobilization. Analyze the data statistically using a one-way analysis of variance (ANOVA) test in a spreadsheet software at significance levels of 0.01 and 0.05. NOTE: Based on these experiments, a PS cover film with high oxygen permeability was deemed suitable (see the representative results). These PS films are included with the worm sheets. PET film, which has low oxygen permeability, was not deemed suitable because the animals tended to suffocate if covered with it during long-term immobilization on the worm sheets. It is also important that the cover film does not break during a series of procedures; glass covers were therefore also unsuitable (see the representative results). NOTE: Disposable, sterile gloves should be worn to avoid contaminating the worm sheets. Place a thin transparent sheet such as a PS or glass cover film which has no autofluorescence, for use as a bottom cover film, onto the experimental desk or the microscopic stage. Place a worm sheet gently onto the bottom cover film using flat tweezers. NOTE: In addition to the worm sheets with 60 µm-wide microfluidic channels (suitable for adults 3-4 days after hatching), sheets with 50 µm-wide channels (suitable for young adults 3 days after hatching and mutants with small body in adult stage) can also be employed. Select a suitable sheet based on the size of the animals to be used. To collect animals, pick up an individual adult C. elegans from the culture plate under a stereomicroscope using a platina picker. Repeat the process if multiple animals are needed. Wash animals to remove food (bacteria). Place at least three droplets (5 µL drops) of buffer solution on the surface of a 6 cm non-treated (water-repellent) Petri dish. Transfer the animals to a droplet using a platina picker and allow them to remove any food by swimming. Wash them twice in two separate droplets, and then rinse the animals in another droplet. NOTE: It is necessary to practice this procedure to be able to perform it quickly before carrying out any experiments. Drop 2-3 µL of buffer solution onto the surface of a worm sheet. Pick up the washed animals from the droplet on the Petri dish and transfer them to the droplet on the worm sheet. Enclose animals in microfluidic channels as follow. Place a PS cover film over the worm sheet using flat tweezers and press gently over the channels from one end of the sheet to the other to maintain humidity (as described previously4,9). NOTE: Animals are randomly enclosed in the channels. Droplets containing animals are spread across the worm sheet by covering the sheet, resulting in droplets being widely extended over several channels. Each animal can be enclosed in any one of these channels. The important point regarding the use of the worm sheet for on-chip immobilization is that multiple channels are available over a wide area. Immediately after enclosing the animals in the microfluidic channels, confirm that they are alive by checking for movement of the head under a microscope (e.g., 1x or 2x magnification). Record animal's position, at the same time as carrying out step 4.6 and note the following on a dedicated sheet of paper (Supplementary File 1): number of the channel in which the animal is enclosed; position of each animal in the channel (left/center/right); and direction of the head. Draw an arrow to mark the position of each animal in the channel, with the direction of the arrow corresponding to the animal's head. NOTE: The channel numbers (e.g., 1, 5, 10, 15, 20, 25) are engraved on the surface of the worm sheet near the left and right edges of the microfluidic channels (Figure 1B). This information on the dedicated sheet allows animals to be located quickly, making the process more efficient, and also helps to prevent radiation leakage during subsequent steps. Immediately after immobilization, remove the cover film from the worm sheet using flat tweezers. Drop 10-15 µL buffer solution onto the microfluidic channels enclosing the animals and observe the animals starting to swim in the droplets under a stereomicroscope. NOTE: The animals start swimming in the new droplet on their own without any additional pressure, help, or push. Just dropping some buffer on top of them is enough to make them swim out of the channel. An animal may be unable to swim in a droplet if it has been vitally damaged by irradiation in step 7.9 or by the immobilization process in steps 4.2-4.5, though this is rare. In addition, if the animal remains attached to the cover film when it is removed, add the droplets onto the cover film instead of into the channels. Pick up the animals swimming in the droplet using a platina picker and place them on an assay plate. NOTE: Worm sheets can be widely used in microscopic observations. The chip can retain water and does not affect the motility of C. elegans individuals after 3 h of on-chip immobilization9. In addition, the chip itself has no autofluorescence, making it suitable for use in fluorescence imaging assays. A sample application for fluorescence imaging assay is given below. Select a fluorescence microscope and mount a digital camera or digital video camera on the microscope to capture images or videos, respectively (Figure 3A). NOTE: The working distance (WD) of microscope is more than 0.2 mm depending on objective lens specification (see Figure 3B,C). The specification of the fluorescence microscope system used in this paper is shown in the Table of Materials. However, the specification is not limited to our example because it depends on the purpose of observation or/and users. Select any fluorescent strain of C. elegans and maintain as described in section 1. NOTE: If it is necessary to observe the body-wall muscular contraction (see representative results), use young adult HBR411C. elegans, in which a reporter gene is used to express the calcium indicator GCaMP3.35 in all body-wall muscle cells. It is important to use young adults (≤3 days after hatching) that are thinner than the width of the microfluidic channels (50 or 60 µm) of the worm sheet. The small degree of clearance means that the animals can bend slightly, making it possible to observe the muscular contraction and extension during crawling, using a calcium-ion indicator. Carry out enclosure of animals according to the immobilization procedure in section 4. Observe fluorescent spots of animals (e.g., green fluorescent protein-labeled strains) using a fluorescence microscope, and capture images using a digital camera mounted on the microscope. NOTE: Follow the previously established methods14,15,16, since the microscope observation methods (including fluorescence observation) and the specification of the microscope system depends on the purpose of the observation. Image calcium-ion wave propagation using video acquisition to observe dynamic activities, such as the body-wall muscular contraction and extension in the HBR4 worms (Video 1). NOTE: The collimating microbeam irradiation system5 can use several heavy-ion particles accelerated from the azimuthally varying field cyclotron installed at the Takasaki Ion Accelerators for Advanced Radiation Application (TIARA) facility of QST-Takasaki (Figure 4A). There is an automatic stage for irradiation under the beam exit (Figure 4B). The procedure for heavy-ion microbeam irradiation of C. elegans using this system is as follows. Locate the worm sheet enclosing multiple animals on an aluminum frame custom-made for the microbeam-irradiation facility and set it on the automatic stage for irradiation (Figure 4C). Raise the irradiation sample (i.e., animals enclosed in a worm sheet on a frame), to immediately under (~2 mm) the beam exit based on the monitor image from a microscope located under the automatic stage (Figure 4D). After vertical positioning, locate each animal to target with the microbeam irradiation using the custom-made software for targeted irradiation of animals and cell cultures. To locate each animal enclosed in the microfluidic channel, refer to the dedicated sheet described in step 4.7-4.8 (see Supplementary File 1) and confirm the channel number near the left and right edges of the channels. Control the automatic stage in the X and Y directions to position the animals just under the beam exit using a remote-control system and a laser mouse operated with the irradiation software. Roughly tune the irradiation area by watching the projection from the microscope located under the automatic stage of the sample and moving the cursor to the irradiation position of the animal to be targeted. After rough positioning, exit and close the irradiation room and move to the adjacent control room to avoid irradiating the operators. 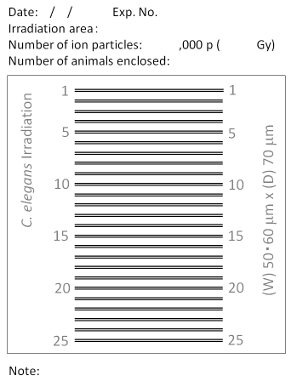 Set the desired number of ion particles for one irradiation procedure, corresponding to irradiation of a specific region of the animal, using the console linked to an ion-counter system. NOTE: This consists of a plastic scintillator and a photoelectron multiplier in the collimating microbeam irradiation system. From the irradiation-control room, fine-tune the position of the animals based on the monitor image from the microscope located under the automatic stage, which is the same image projected on the monitor in the irradiation room (Figure 4E). Target the microbeam irradiation by click the irradiation button of the software for irradiation. NOTE: In the example shown in Figure 4F, we target the pharynx in the head region and irradiate with the appropriate number of microbeam carbon ions. Because the number of ion particles passing through the sample is counted using an ion-counter system linked to the console and the irradiation software, the irradiation is stopped after delivery of the desired number of ion particles. Locate each animal recorded on the dedicated sheet and carry out targeted irradiation to each animal. Repeat steps 7.8 and 7.9 until all animals have been irradiated. Immediately after irradiation, enter the irradiation room and lower the automatic irradiation stage. Remove the sample on the custom-made frame located on the automatic stage. Collect the animals as described in steps 5.1-5.3. Carry out behavioral and/or molecular analyses as required to evaluate the effects of the targeted irradiation, depending on the purpose of the study. NOTE: The locomotion assay described in step 3.6 is an effective method for evaluating the effects of irradiation on motility4,9. NOTE: Worm sheets can be used repeatedly at least 10 times9 with no adverse effects on the animals if cleaned and sterilized properly after use as follows. Place the used worm sheet on a 6 cm Petri dish and drop about 100 µL of sterilized ultrapure water onto the whole sheet. Paddle the water on the surface of the sheet using gloved fingers to wash off dirt such as dust, bacterial food, and any eggs laid in the channels. Wipe the moisture off the worm sheet thoroughly using disposable wipes. Inject about 5 mL of 70% ethanol into the Petri dish containing the worm sheet and paddle the surface of the sheet using gloved fingers to wash off the dirt. Remove the chips from the Petri dish filled with 70% ethanol and allow to dry naturally. After drying, place the worm sheet on a sterile Petri dish and cover it. Sheets can also be stored on a sterile Petri dish filled with 70% ethanol. NOTE: It is better to dispose of the cover films after use, but if they are to be re-used, clean them as done for the worm sheet. However, if folds develop on the cover film after use it will no longer adhere to the chip, resulting in dehydration of the animals, and it should therefore be replaced. Active C. elegans individuals could be immobilized successfully using an ultra-thin, wettable PDMS, microfluidic chip (worm sheet). We investigated the suitability of different cover films for sealing the worm sheet, as described in protocol section 3. To evaluate the sealing effects of the cover films, we determined the motility of animals 3 h after on-chip immobilization using cover glass (thickness: 130-170 µm), PET film (thickness: 125 µm), and PS film (thickness: ~130 µm), respectively. 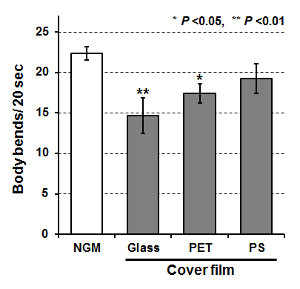 As shown in Figure 5, there was no significant difference in motility (body bends) between control animals allowed to move freely for 3 h and animals enclosed in the worm sheet with PS film. In contrast, motility was significantly reduced in animals enclosed under a cover glass. Some animals appeared to have dried out, suggesting that the cover glass repelled the droplet, preventing a close seal and allowing the animals to partially dry out, resulting in reduced motility. The motility of animals enclosed using a PET film was also significantly decreased; although no drying was observed, the animals' motility tended to decrease uniformly, suggesting that the low oxygen transmission rate (~30 mL/[24 h·m²·MPa]), which is about 100 times lower than that of PS, caused the animals to suffocate. These results suggest that PS cover films should be used to enclose animals in the worm sheet. We also applied the worm sheet technique for imaging observations and to perform region-specific microbeam irradiation. On-chip immobilization using a worm sheet with water retention and no autofluorescence was suitable for microscopic observation under live conditions. For example, we applied the technique to the HBR4 strain11 of C. elegans, in which a reporter gene expressed the calcium indicator GCaMP3.35 in all body-wall muscle cells. We observed the activities of all body-wall muscle cells in young adult animals at ≤3 days post-hatching in worm sheets with 50 µm-wide microfluidic channels, which allowed the animals space to bend slightly. The GCaMP3.35 signal intensity in the HBR4 strain corresponds to the contraction of the body-wall muscle cells. The Ca2+ wave propagation corresponding to the muscular activity was clearly observed (Video 1). Additionally, we confirmed that the worm sheet had no autofluorescence as shown in the last stage (last ~10 s) of Video 1. In this way, the lack of need for anesthesia allowed the physiological activities of the muscle cells to be observed under live conditions. Furthermore, we applied the worm sheet for region-specific microbeam irradiation of C. elegans individuals. The multiple straight microfluidic channels on the worm sheet allowed multiple animals to be immobilized simultaneously, without the need for anesthesia, thus allowing sequential irradiation of ≥20 animals (enough for a group assay) in a short time (30 min for 20 individuals). Figure 1: Schematic of a worm sheet. (A) Overview of a worm sheet with an American 1 cent coin for scale. The worm sheet was 300 µm thick, 15 mm wide, and 15 mm long. (B) The surface of the worm sheet contained 25 straight microfluidic channels (depth = 70 µm; width = 60 µm; length = 8 mm). (C) Schematic of the samples consisting of the bottom cover film, the worm sheet, and the cover film. (D) The worm sheet is a soft, ultra-thin sheet made from PDMS, and can be bent by pinching with flat tweezers. (E) Example of multiple animals enclosed in multiple channels. (F) Expansion of a microfluidic channel by pushing with a platina picker. The elasticity of the channel allows animals to be enveloped gently. Please click here to view a larger version of this figure. Figure 2: Body form of C. elegans. (A) Wild-type (N2) C. elegans on an NGM plate. (B) An unc-119 mutant with abnormal shape on an NGM plate. (C) The unc-119 mutants enclosed in the microfluidic channels of the worm sheet. Please click here to view a larger version of this figure. 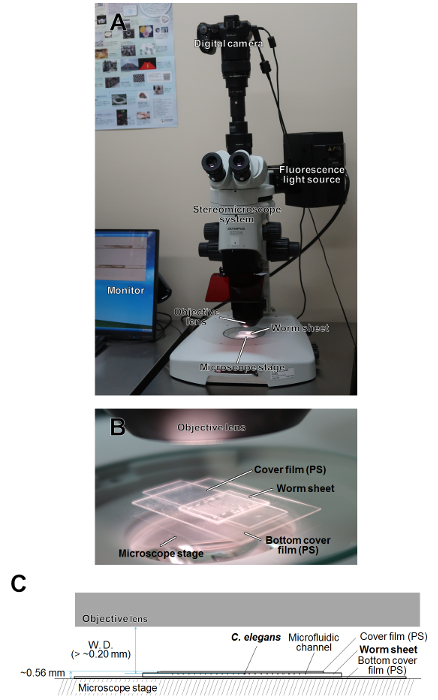 Figure 3: Schematics of microscope observation of live C. elegans individuals enclosed in the worm sheet. (A) Schematic of the stereomicroscope system for imaging observations. (B) Schematic of microscope observation of the worm sheet enclosing live C. elegans individuals. (C) Sectional view of the worm sheet enclosing live C. elegans individuals placed on the microscope stage. W.D. indicates the working distance of microscope. Please click here to view a larger version of this figure. Figure 4: Schematic of collimating microbeam system at QST-Takasaki and targeted microbeam irradiation procedure for live C. elegans individuals. (A) Overview of the collimating microbeam irradiation system5, which can use several heavy-ion particles accelerated from the azimuthally varying field cyclotron installed at the TIARA of QST-Takasaki. (B) Overview of the beam exit and the automatic stage for irradiation. (C) Sample setting on the automatic stage of the collimating microbeam system. (D) Vertical positioning of the irradiation sample conducted in the irradiation room. (E) Fine-tuning of irradiation area conducted in the irradiation-control room. (F) Targeted microbeam irradiation of live C. elegans. The pharynx was clicked-on as the targeted position and irradiated by pushing the irradiation button. Please click here to view a larger version of this figure. Figure 5: Motility of C. elegans after on-chip immobilization using cover glass, polyester (PET) film, and polystyrene (PS) film. Bars indicate mean body bends of animals 3 h after on-chip immobilization or after free movement for 3 h on an NGM plate (control). Ten animals were examined and body bends were averaged among each group. Finally, data from five independent experiments were averaged for each group. Error bars represent standard error of the mean of five independent experiments. All data were analyzed using one-way ANOVA at the 0.05 (*) or 0.01 (**) significance level. Please click here to view a larger version of this figure. Supplementary File 1: Example of dedicated sheet of paper (microbeam irradiation version). Draw an arrow to indicate the position of each animal in the channel. The direction of the arrow corresponds to the head. Please click here to download this file. On-chip immobilization of C. elegans under live conditions using a wettable PDMS microfluidic chip enables the efficient targeted microbeam irradiation of multiple animals. The ease of handling and features to prevent drying make this system suitable for applications not only in microbeam irradiation, but also in several behavioral assays. These worm sheets have already been commercialized and can be easily obtained. Conventional microfluidic chips, such as olfactory chips, are associated with problems including clogging of animals and eggs in the closed microfluidic channels making it difficult to collect the animals, and thus such chips have tended to be disposable, thereby increasing the cost. In contrast, the microfluidic channels in the current worm sheet are open, making it easier to collect the animals. These worm sheets can therefore be used repeatedly, making them more economical. Recent technological innovations in PDMS microfluidic chips have shown an increasing trend in structural complexity and multifunctionality16,18,19,20,21,22,23. However, we believe that it is important to make the system simple and easy to use. Indeed, in contrast to the use of conventional large microfluidic chips19,20,21,22,23 that require the attachment of a vacuum pump, the small size and simple design of the worm sheets allow procedures to be conducted easily within a limited space. The water retention performance of the worm sheets enables long-term observations to be carried out. In addition, the thickness of the sheet allows ion particles to pass through the samples, thus enabling targeted irradiation to be applied to live C. elegans individuals with a precise number of ion particles. These advantages of the worm sheets have greatly expanded the possibilities for biological experiments. We believe that it is important for biologists to develop new equipment and methods in order to improve the efficiency of their experiments and analyses. 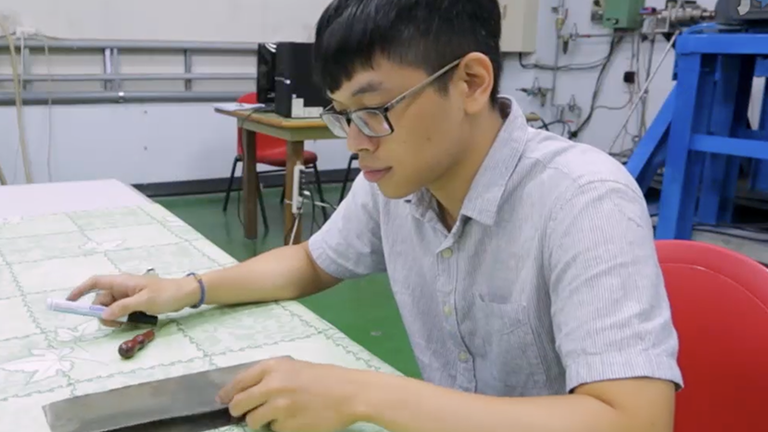 The worm sheets and microbeam irradiation software have been developed with this aim in mind, and have the potential to contribute to the success of future innovative experiments beyond their original objectives. To the best of our knowledge, our group is the first to develop this technology worldwide. However, its standardized use in the future will facilitate the application of targeted microbeam irradiation to animals under live conditions, thus helping to identify the roles of specific cells/tissues in internal processes. The authors thank Dr. Atsushi Higashitani for kind advice regarding treatment of C. elegans and Drs. Yuya Hattori, Yuichiro Yokota, and Yasuhiko Kobayashi for valuable discussions. The authors thank the Caenorhabditis Genetic Center for providing strains of C. elegans and E. coli. We thank the crew of the cyclotron of TIARA at QST-Takasaki for their kind assistance with the irradiation experiments. We thank Dr. Susan Furness for editing a draft of this manuscript. This study was supported in part by KAKENHI (Grant Numbers JP15K11921 and JP18K18839) from JSPS to M.S. C. elegans transgenic strain HBR4 Caenorhabditis Genetics Center (CGC) , Minnesota, USA HBR4 The genotype of this transgenic C. elegans strain is HBR4:goeIs3[pmyo-3::GCamP3.35:: unc-54–3’utr, unc-119(+)]V. This strain was only employed for imaging observation. Worm Sheet 60 Biocosm, Inc., Hyogo, Japan BCM18-0001 Microfluidic chip with 20 straight 60 µm-width channels. This is sitable for adults 3-5 days after hatching at 20°C. Worm Sheet 50 Biocosm, Inc., Hyogo, Japan BCM18-0002 Microfluidic chip with 20 straight 50 µm-width channels. This is sitable for youg adults ~3 days after hatching at 20°C. Polystyrene Film Biocosm, Inc., Hyogo, Japan BCM18-0001/ BCM18-0002 Bundled items of Worm Sheets. PS filim (thickness: ~130 µm) used in locomotion assays in Protocol 3. Motorized Focus Stand for SZX16 OLYMPUS CORPORATION, Tokyo, Japan SZX2-ILLB This was used for bright field observation in Protocol 3-8. Objective Lens (×1) OLYMPUS CORPORATION, Tokyo, Japan SDFPLAPO1×PF NA: 0.15; W.D. : 60 mm. This lends was used for bright field observation in Protocol 3-8. Objective Lens (×2) OLYMPUS CORPORATION, Tokyo, Japan SDFPLAPO2XPFC NA: 0.3; W.D. : 20 mm. This lends was used for imaging observations. Mercury Light Source OLYMPUS CORPORATION, Tokyo, Japan U-LH100HG The broad emission spectrum enables a range of fluorescence imaging experiments to be conducted using all common fluorophores. SZX16 Fluorescent filter unit (High performance for YFP) OLYMPUS CORPORATION, Tokyo, Japan SZX2-FYFPHQ Ex: 490-500 nm; Em: 510-560. This was used for imaging observation of HBR4 strain. Digital Camera High Speed EXILIM CASIO COMPUTER Co., Ltd, Tokyo, Japan EX-F1 Figure 1B, 1E, 1F, Figure 2A-C, and Video 1 were obtained by using this digital camera. Funayama, T., Hamada, N., Sakashita, T., Kobayashi, Y. Heavy-Ion microbeams-development and applications in biological studies. IEEE Transactions on Plasma Science. 36, (4), 1432-1440 (2008). Tanaka, A., Shikazono, N., Hase, Y. Studies on biological effects of ion beams on lethality, molecular nature of mutation, mutation rate, and spectrum of mutation phenotype for mutation breeding in higher plants. Journal of Radiation Research. 51, (3), 223-233 (2010). Ghita, M., Fernandez-Palomo, C., Fukunaga, H., Fredericia, P. M., Schettino, G., Bräuer-Krisch, E., Butterworth, K. T., McMahon, S. J., Prise, K. M. Microbeam evolution: from single cell irradiation to pre-clinical studies. International Journal of Radiation Biology. 94, (8), 708-718 (2018). Suzuki, M., Hattori, Y., Sakashita, T., Yokota, Y., Kobayashi, Y., Funayama, T. Region-specific irradiation system with heavy-ion microbeam for active individuals of Caenorhabditis elegans. Journal of Radiation Research. 58, (6), 881-886 (2017). Funayama, T., Wada, S., Yokota, Y., Fukamoto, K., Sakashita, T., Taguchi, M., Kakizaki, T., Hamada, N., Suzuki, M., Furusawa, Y., Watanabe, H., Kiguchi, K., Kobayashi, Y. Heavy-ion microbeam system at JAEA-Takasaki for microbeam biology. Journal of Radiation Research. 49, (1), 71-82 (2008). Sugimoto, T., Dazai, K., Sakashita, T., Funayama, T., Wada, S., Hamada, N., Kakizaki, T., Kobayashi, Y., Higashitani, A. Cell cycle arrest and apoptosis in Caenorhabditis elegans germline cells following heavy-ion microbeam irradiation. International Journal of Radiation Biology. 82, (1), 31-38 (2006). Fukamoto, K., Shirai, K., Sakata, T., Sakashita, T., Funayama, T., Hamada, N., Wada, S., Kakizaki, T., Shimura, S., Kobayashi, Y., Kiguchi, K. Development of the irradiation method for the first instar silkworm larvae using locally targeted heavy-ion microbeam. Journal of Radiation Research. 48, (3), 247-253 (2007). 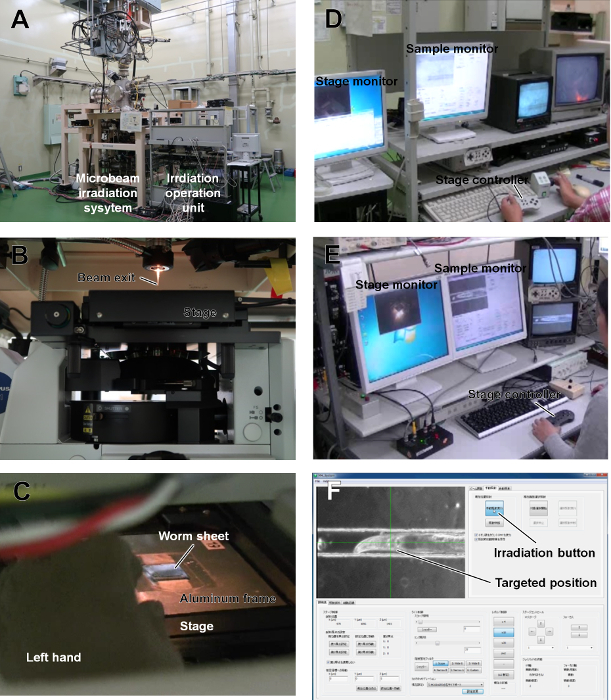 Yasuda, T., Kamahori, M., Nagata, K., Watanabe-Asaka, T., Suzuki, M., Funayama, T., Mitani, H., Oda, S. Abscopal activation of microglia in embryonic fish brain following targeted irradiation with heavy-ion microbeam. International Journal of Molecular Sciences. 18, (7), 1-15 (2017). Suzuki, M., Sakashita, T., Hattori, Y., Yokota, Y., Kobayashi, Y., Funayama, T. Development of ultra-thin chips for immobilization of Caenorhabditis elegans in microfluidic channels during irradiation and selection of buffer solution to prevent dehydration. Journal of Neuroscience Methods. 306, Aug 1 32-37 (2018). Brenner, S. The genetics of Caenorhabditis elegans. Genetics. 77, (1), 71-94 (1974). Schwarz, J., Spies, J. P., Bringmann, H. Reduced muscle contraction and a relaxed posture during sleep-like Lethargus. Worm. 1, (1), 12-14 (2012). Saeki, S., Yamamoto, M., Iino, Y. Plasticity of chemotaxis revealed by paired presentation of a chemoattractant and starvation in the nematode Caenorhabditis elegans. Experimental Biology. 204, Pt 10 1757-1764 (2001). Sawin, E. R., Ranganathan, R., Horvitz, H. R. C. elegans locomotory rate is modulated by the environment through a dopaminergic pathway and by experience through a serotonergic pathway. Neuron. 26, (3), 619-631 (2000). Momma, K., Homma, T., Isaka, R., Sudevan, S., Higashitan, A. Heat-induced calcium leakage causes mitochondrial damage in Caenorhabditis elegans body-wall muscles. Genetics. 206, (4), 1985-1994 (2017). Kerr, R. A. Imaging the activity of neurons and muscles. WormBook. 2, 1-13 (2006). Aubry, G., Lu, H. A perspective on optical developments in microfluidic platforms for Caenorhabditis elegans research. Biomicrofluidics. 8, 011301 (2014). Lumirror Catalog. TORAY. Available from: https://www.toray.jp/films/en/products/pdf/lumirror.pdf (2018). Otobe, K., Itou, K., Mizukubo, T. Micro-moulded substrates for the analysis of structure-dependent behaviour of nematodes. Nematology. 6, (1), 73-77 (2004). Chronis, N., Zimmer, M., Bargmann, C. I. Microfluidics for in vivo imaging of neuronal and behavioral activity in Caenorhabditis elegans. Nature Methods. 4, (9), 727-731 (2007). 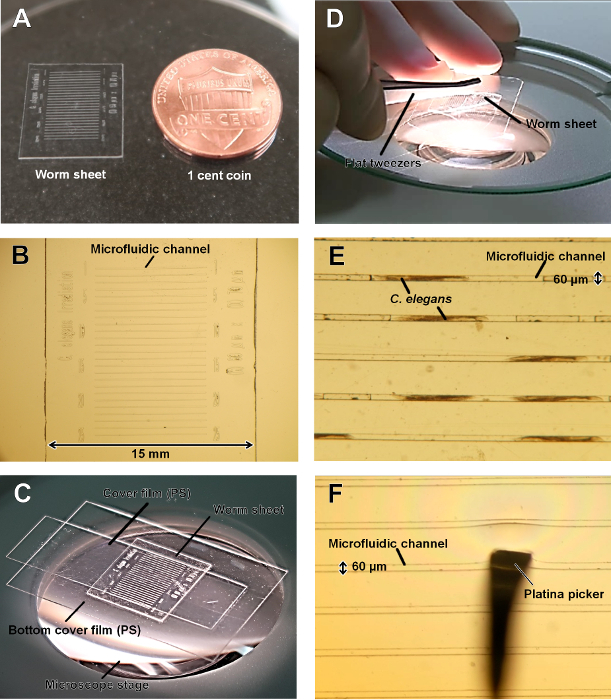 Hulme, S. E., Shevkoplyas, S. S., Apfeld, J., Fontana, W., Whitesides, G. M. A microfabricated array of clamps for immobilizing and imaging C. elegans. Lab on a Chip. 7, (11), 1515-1523 (2007). Lockery, S. R., Lawton, K. J., Doll, J. C., Faumont, S., Coulthard, S. M., Thiele, T. R., Chronis, N., McCormick, K. E., Goodman, M. B., Pruitt, B. L. Artificial dirt: Microfluidic substrates for nematode neurobiology and behavior. Journal of Neurophysiology. 99, (6), 3136-3143 (2008). Gilleland, C. L., Rohde, C. B., Zeng, F., Yanik, M. F. Microfluidic immobilization of physiologically active Caenorhabditis elegans. Nature Protocols. 5, (12), 1888-1902 (2010). Fehlauer, H., Nekimken, A. L., Kim, A. A., Pruitt, B. L., Goodman, M. B., Krieg, M. Using a microfluidics device for mechanical stimulation and high resolution imaging of C. elegans. Journal of Visualized Experiments. (132), e56530 (2018).